The perfect pan for melting chocolate (I no longer bother with a bain marie) or making scrambled eggs for two, or heating a small quantity of anything that needs a lot of stirring. A delight to use, easy to clean, comfortable in the hand. Love it. 519 customers found this review helpful. Did you? Yes, I did! Difficult to describe, but easy to love… having the cookware you've always wanted is a dream come true, but in a practical sense, this is the best, most beautiful, easiest to clean cookware I have ever had in my life. Once I understood the principles behind a copper bottom and stainless lined pan, nothing sticks, cleanup is a joy, heat distribution is immaculate, and my food is not only a pleasure to cook but even more enjoyable to eat. 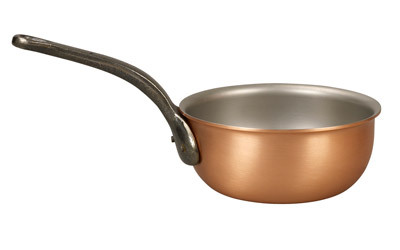 I have no hesitation in recommending Falk Culinaire to anyone who might be thinking of purchasing any kind of new pan. 523 customers found this review helpful. Did you? Yes, I did! 667 customers found this review helpful. Did you? Yes, I did!